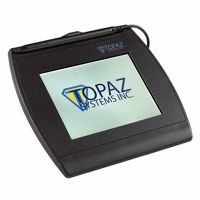 SignatureGem® LCD 4x3 includes all the high-quality electronic signature capture features of Topaz signature pads with the added feature of a bright backlit LCD interactive display, allowing users to see "electronic ink" under the pen tip as they sign as well as navigate and display text and graphics. 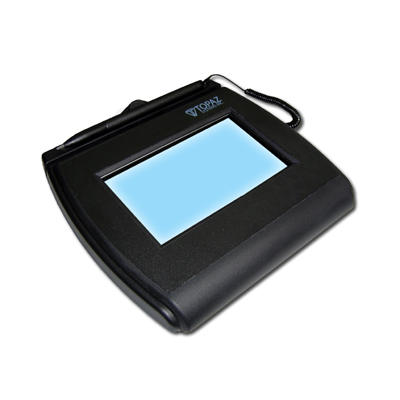 SignatureGem® Backlit LCD 4x3 includes all the high-quality features of our electronic signature pad with the added feature of a bright backlit LCD interactive display, allowing users to see "electronic ink" under the pen tip as they sign as well as navigate and display text and graphics. The wide signing area and rugged tempered glass signing surface make this a versatile pad for the most demanding applications. The Backlit Colour LCD model has a 4" x 3" transflective LCD screen with a bright backlight for improved viewing in any ambient lighting conditions. 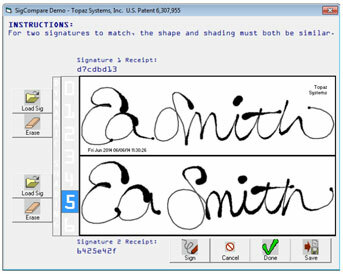 *Signatures appear on the pad screen under-the-pen as the user signs. In addition, the LCD display can be used to display information to the user, and can also display on-screen buttons, hot-spots and checkboxes. 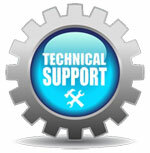 All our SignatureGem LCD range are now fitted with e-Tether pen. These "active" pens draw their power from the tether to the unit (which derives its power from the computrer connection). This does away with the need for batteries to drive the pen. The "-BHSB" model has both Serial and HID USB connections available for the model. 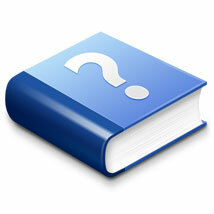 There is a USB device which uses the Human Interface Device (HID) class of USB driver built into Microsoft Windows and other leading operating systems and computers. There is also a serial connection. It connects to a PC or Termial via an RS232 connection (pad has a female 9-pin connector - see image above). Typically less common than the USB connection, Serial is having somewhat of a comeback in the expanding Remote Access environment, being ideal for Citrix and/or Terminal services architecture.